Psychedelic Rob the Frog only has 20 mates left in the world. The Southern Corroboree Frog is Australia’s most endangered frog: there are only 20 of them left in the wild. You should pause here and think about that — 20! Who would you pick to breed with? What if you didn’t love them? These guys are probably the most amazing-looking frogs in the world. None come close to the dazzling beauty of their fluro stripes (unless you don't like frogs!). These frogs are really picky. They only live in one spot up in the snowfields of New South Wales, in Kosciuszko National Park. It’s here that they can appease their pickiness with the right places to breed (pools, bogs and tussocks of grass) and places to eat and hang out when the breeding is over (in the woodlands and heathlands). First of all, we just wanted to tell you how small these frogs are. They are tiny — the size of a five cent piece. Just like other frogs, they eat ants and other bugs. So why don’t other frogs have amazing stripes? The males call out to females from their tiny little moss nests in sweet little pads along the pools. During breeding season, the pools, which is when the females lay their eggs, dry up. If the male impresses the female, she will lay her eggs in his nest and he stays to look after them. Southern Corroboree Frogs only produce around 20–40 eggs per female, which is low for a frog. It takes a whopping four years before they are able to breed – isn’t that like 75 human years!? 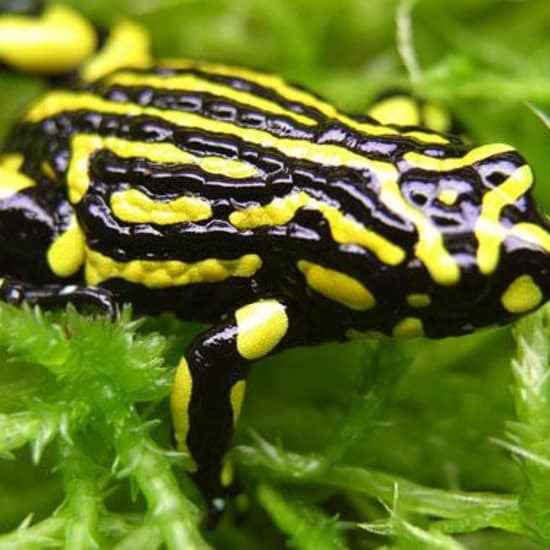 Zoos Victoria have secured the Corroboree frog in captivity so they will survive, but now the ultimate aim is to get a disease-free population setup in the wild. It is pretty disgusting, but it’s true: a fungus—the Amphibian Chytrid Fungus—is rotting their skin away and killing them. Check out Zoos Victoria’s video about Rob the frog—at www.youtube.com/watch?v=fFAXB48TNyE— to find out more about the tough time the Southern Corroboree Frog are having right now. • $10,000: For this amount, we can start moving street smart frog eggs from Zoos Victoria to a few disease-free areas in the Kosciuszko National Park. We might even get Border Force in to ensure no disease is getting through. This will mean Rob has a better chance of finding a mate who isn’t diseased. Zoos Victoria have trialled this process and now want to ramp it up to get the population flourishing. • $50,000: We can then start building the toughest stud from Rob the Frog. We need to toughen the frogs up so they can better resist the fungus. Zoos Victoria will continue selecting the best-suited frogs in captivity and breed from them. These ones will be released back into the wild at the disease-free spots in the national park. • $100,000+: We can really get stuck into the research to figure out how to boost the frog's immune system and finally defeat this fungus forever. Zoos Victoria are doing all this work, along with a stack of other partners. Their work has been going on for a long time and they are perfecting the art of saving these amazing creatures. Donate directly to Zoos Victoria.